What happens when you run out of "fuel" on the highway? After I explain that my Nissan Leaf will tell me when I'm low on fuel (multiple times) and guide me to the nearest charging station, people are impressed with the final answer: In the very near future, I can call AAA and they will drive a truck out to give me a 10 minute charge that gives me about 10 miles of range. There are 6 currently deployed...and one is in Tampa, just 80 miles away from me. Compressed Natural Gas (CNG) driven generator. Generator powered by truck's engine. 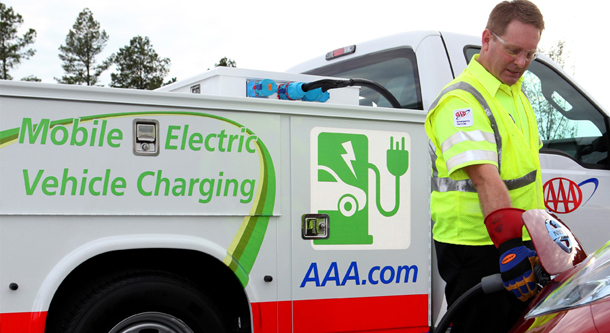 Since using a Lithium Battery Pack to charge an electric vehicle is a new idea, AAA worked with Green Charge Networks to create a custom solution that fit into AAA's existing service trucks. 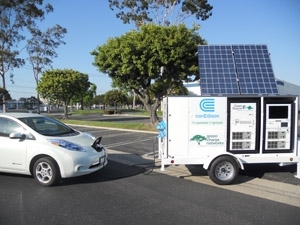 Creating a mobile EV Charging solution was a logical next step for GCN, as they had been making mobile energy storage solutions for utilities that enable EV charging at any location, such as sporting or music events. GCN was founded in 2007 by Ron Prosser, who had a long and very successful career with Boeing and Rockwell (see GCN's website). The bi-coastal company (CA-NY) is now run by Ryan Prosser, Ron's son. The company was one of the first to use Lithium Batteries for Energy Storage...with the intent of charging the system off-peak (when there is a surplus of cheaper energy) and discharging the batteries when there is quick demand for electricity (a demand spike), such as when a big motor, A/C, or refrigeration systems starts up. 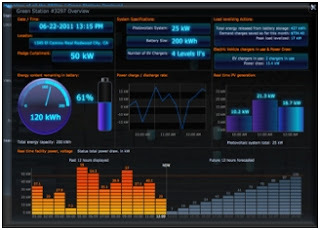 The idea is to use stored energy to flatten out these demand spikes so that they don't affect the electric utility company's infrastructure. What's wrong with demand spikes? Electric Utilities have a mission to provide electricity 24x7...without fail. To do this, they must size transformers and wires so that they can deliver enough electricity across their service area without overloading. While utilities charge for fuel usage and generation, most utilities charge commercial electricity customers a "demand" charge which is based on highest amount of kW usage in a time period...in most cases this is a 15 minute time period). This demand charge is to offset the infrastructure needed to get the maximum power to your building. This means if a business normally uses 70 kW...but uses 200 kW for 5 minutes when A/C systems are turned on in the morning, the business pays a demand charge on the 200 kW. Demand charges vary, but in Florida they are $5/kW...so in this instance an extra 200kW x $5 = $1,000 would be added to your bill. If your building didn't have this demand spike...you could save $650 a month...and that's the business case for GCN's GreenStation product. 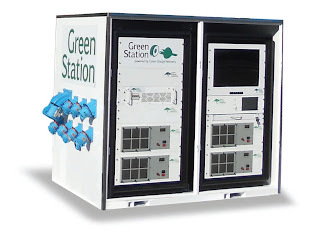 The GreenStation has a battery pack sized for the energy need (68 kWh typical) and control hardware/software, which can profile, detect, and act on demand spikes while recharging off-peak. 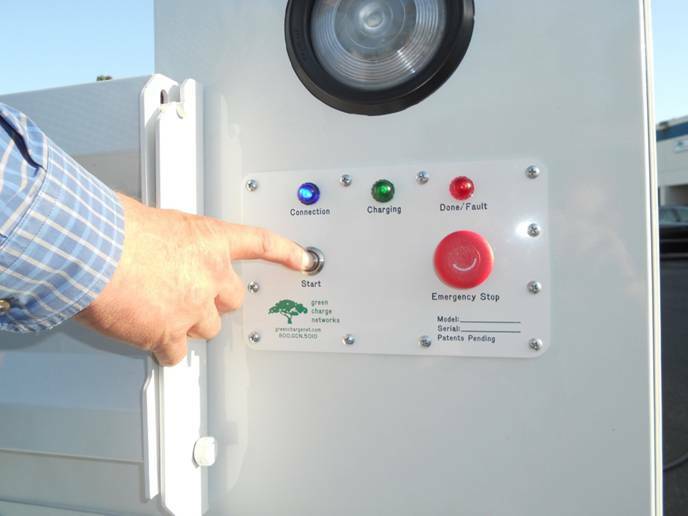 They also have a mobile version of the Greenstation with a 68kW battery pack to provide energy management to buildings or charging electric cars at any location, such as sporting or music events....the mobile version could give 15 Leafs a 20 mile charge. 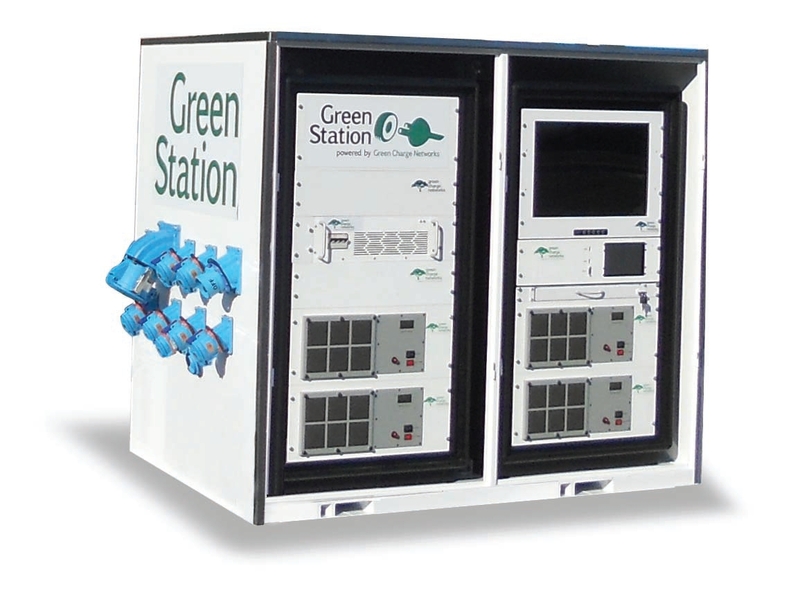 The GreenStation was developed with ConEdison of New York, which is also GCN's first customer. GreenStations have also been deployed at 7-Eleven, and AVIS Rent a Car at La Guardia Airport to fast charge their fleet of Nissan Leafs. Electric vehicles are one of the best inventions in automobile industry. When all of our fossil fuels will run out, people will soon realize the vision of the first inventors of this technology. I agree with Helen that electric vehicles, so far, is one big leap in automobile history. But from there, we should also salute the oil industry for being a part of it, and making it possible. I share those concerns with other hesitant electronic car buyers. Arizona is a large highway and I hope more of those rescue mobiles for charging gets more numbers. Running out of gas in the middle of the desert. What I love about these kind of cars is we get enjoy the benefits of modern transportation and get to also enjoy the goodness it brings to our nature. Inventions like these are just amazing and very beneficial. I haven’t seen a mobile charging on a service truck. I am giving it a try and see if these inventions can improve my lifestyle as well as my financial matters. I've been reeling for this kind of alternatives cause as you know, I've been hearing a lot of good effects about this kind of mechanism. It's good to hear that, inventors and car creators come up with something more practical and lesser polluted than the usual fuel-generated vehicles.